Mueller and the Russians – Huge Head Fake? Did you say Russians, Big Red Car? Big Red Car here enjoying the memory of Presidents Lincoln and Washington. Ahh, on Earth as it is in Texas. I have been trying to stay away from the Russian – Trump collusion dialogue for a while, but the huuuuuuuuuge Mueller Russian indictment has me scratching my head. Let me share a few thoughts with you, may I? 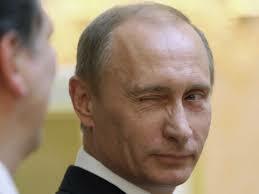 This guy, Vladimir Putin, is a former KGB guy. He runs Russia. He is a prick and a butcher. Big Red Car here. SXSW in the ATX, ya’ll. Big time — 250,000 nerds and hipsters can’t be wrong can they?